17" Racing Hart Mags, M's Racing Pod filter with custom cold airbox/induction ( standard road use), 80mm Custom ram tubes/ induction clamber (racing events), TRD Spark Plugs & Leads, 4 into 1 stainless headers with standard exhaust (road use), Headers with 50mm straight through exhaust (racing events), Full custom Sony Xplode sound system install, BOMEX bodykit, & so to be lowered with a HKS Adustable Lowering kit. I guess you could say that im a Toyota man through & through. 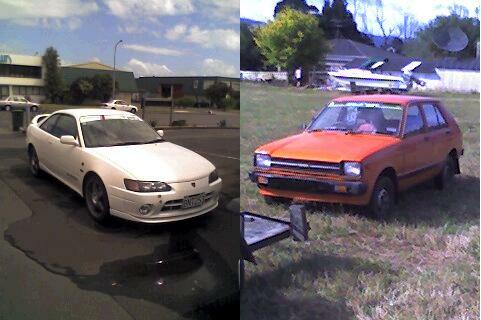 Ive had 5 toyotas, a 1987 toyota corolla, 1991 toyota corolla FXGT, 1991 toyota trueno, and currently I have a 1997 toyota trueno BZR & a 1983 toyota starlet KP60 rally car. I belong to the Pukekohe Car Club & race both cars in different events during the year, including hillclimbs, motorkana's, bentsprints & track days at pukekohe race track.